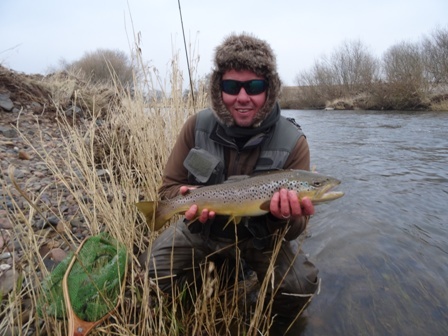 Within 10-14 days the hatches of March Browns will be underway on the rivers of Northern England and the Borders. 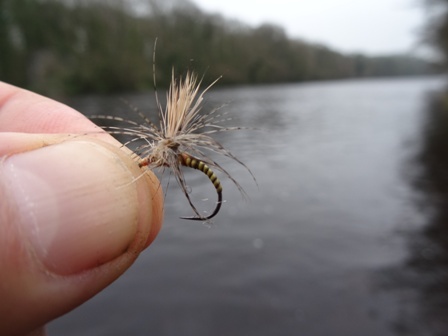 This can be excellent for the dry fly or those who use soft hackles or spiders. It is also a tricky time of year to fish and in over 20 years of looking forward the hatch, I can remember it only once being warm and sunny. Early to mid April is generally blustery almost invariably freezing or feeling like it! But we will keep an eye on conditions and if good weather is forecast make a raid on the Tweed and fish for specimen brownies. Over the years I have been rewarded with big trout from both the Tweed and its tributary the Teviot. The Teviot trout shown below is from February whilst fishing for grayling using heavy nymphs. Catching similar and bigger fish on dry flies is always challenging but always possible. If you are in the right place at the right time you generally get opportunities for something special on dry fly. 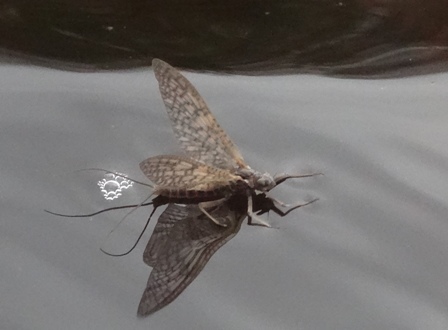 The March Brown hatch can be sporadic often coating the water in duns in an instant followed by nothing at all. But they can trickle off and even hatch in waves all day (from 11.30 onwards). But generally it’s “a make hay while the sun shines” style of fishing. That is when the duns are on the water generally fish will rise and you need to fish then because it might not last more than a couple of minutes. So being able to spot rising fish is an advantage as well as being ready. A deer hair emerger pattern like the one pictured is my dry fly of choice. Or if they are definitely taking duns then the soft hackle dry fly works very well. It is a variation on a Border’s pattern the jingler a fly frequently used in blustery conditions to great effect- fished both dry and wet and often in between. Wet flies and spiders like the eponymous March Brown or the Onstream-Guide plover spider work a treat as well. We hope for calmer weather and possibly an interesting video targeting wild specimen brown trout on the Tweed. 64 cm and around 7lb is my current best but I have hooked and lost larger ones. If I see any of you up there I will say hi. I bumped into my old friend Stuart Crofts up there one year characteristically looking at the March Browns hatching rather than fly fishing. He is a renown Entomologist and a true gentleman and often writes and talks about his passion. Happy Easter and Good luck to you all!